Old Bones Never Die ($15.95, 272 pages, ISBN: 978-1-60381-317-4) is the fifth cozy mystery by Lesley A. Diehl in a series set in rural Florida and featuring consignment shop owner and amateur sleuth Eve Appel. After the half-brother of Eve’s friend Sammy finds human bones on a construction site, he is killed in a hit-and-run. People usually try to discourage Eve’s amateur sleuthing, but this time Sammy and his half-brother’s orphaned nephews urge her to investigate. The series began with A Secondhand Murder and continued with Dead in the Water, A Sporting Murder, and Mud Bog Murder. Three short stories, available as Kindle Singles only, also feature Eve Appel. Lesley has written numerous other short stories and has seven other published mysteries: A Deadly Draught, Poisoned Pairings, Dumpster Dying, Angel Sleuth, Grilled, Chilled, and Killed¸ Murder is Academic, and Failure is Fatal. “I can tell you that I have found a new hero in Eve Appel. She is one sassy, funny, and determined woman. The author has done a great job of keeping the story at a high caliber level with a mystery within a mystery.” Read more…. “This book was so wonderful, that I hope to chat with Eve one day. She seems like the kinda character a book lover would want to know. I know I do!” Read more…. “Another terrifically entertaining read from a master of the genre, Old Bones Never Die is the fifth book in author Lesley Diehl’s Eve Appel Mystery series and unreservedly recommended for community library Mystery/Suspense collections and the personal reading lists of all dedicated mystery buffs!” Read more…. “A light, fast moving read, with enough suspense to keep you turning the pages. The solution to the mystery was not predictable (always a plus), and the story came to a satisfying solution. I also enjoyed the glimpse into Miccosukee heritage and the descriptions of Southern Florida, with its swamps, weather and wildlife.” Read more…. 4 Stars: “This writer’s style is easy to read, she closes up any gaps in the story line and she’s made me want to read another in this series. Eve and Sammy are a joy to read about.” Read more…. “Just as I loved Laura Murphy in Murder is Academic and Failure is Fatal, I’m a big new fan of Eve Appel in Lesley A. Diehl’s Old Bones Never Die.” Read more…. “I like the mystery inside the mystery and Eve is one tough lady who is also funny and sassy. You will want to know more about her. A book you will not want to put down.” Read more…. “It was so cool how the author was able to create a mystery within a mystery without losing the reader. This is positively a series I will be catching up with and continue to follow.” Read more…. “I loved my introduction to Eve Appel and her snooping friends. 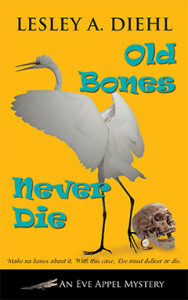 Old Bones Never Die is book 5 in the Eve Appel series. I found myself a few pages in wondering where I’ve been. How could I have missed this author and this series? [….] Although Old Bones is book 5 I didn’t feel like I needed to read any of the prior books in the series. But I ended up wanting to.” Read more…. Smoke. Heavy, stale, like a burned-out campfire. I moved out of the doorway and back into the hall. Someone was in the house. I knew it. I stopped and listened, but I heard nothing except my own heart racing in my chest until the compressor in the refrigerator kicked in. Wherever the intruder was, he or she had to have seen the lights of my car and Sammy’s truck. Wouldn’t the person be eager to get out of here to avoid discovery? Unless my unwanted visitor had something else in mind. I tried not to let my imagination provide unpleasant scenarios. I sniffed again. The smell seemed less pronounced. Maybe they had left. Better not to take chances. I retreated down the hallway toward the living room. I’d turned on the ceiling light when I came in the door, but turned it back off at the switch on the wall by the hallway leading to the bedroom. I flipped the light back on and sighed with relief. No one was in the living room, and I could see across the way into the kitchen. The door to the garage was closed, but was it locked? Had my unwelcome visitor left by that exit and was now hiding in my garage? Or maybe in the bathroom or my guest room? Perhaps they’d gone out through the back door. I glanced at my purse on the couch. Get the hell out of the house, Eve, and call the cops. I moved toward the couch and reached for my purse to get my cellphone on my way out. The overhead light went out. Before I could retrieve my purse and retreat to the door, a hand encircled my throat in a steel grip. I tried to pull it away, but the hold tightened, and I thought I might pass out. I stumbled backward, reaching for the door knob. Another hand grabbed my arm. “Quiet or you’re dead.” It was a man’s voice I thought I’d heard before, but he hadn’t spoken enough words for me to identify it. I tried to pull back, but he brought both his hands to my throat and tightened them. The pressure around my eyes mounted. I coul“What do you want?” I managed to squeak out. He said nothing, but pressed his thumbs into my throat and rammed his body against mine, moving me out of the living room and into the hallway. If I’d left my stiletto heels on, I might have been able to stomp on his instep and do some damage. They were, miraculously, still in my hand, but I was too weak to take any kind of a swing at him. My shoes had never failed me before. They’d always proven to be an effective weapon. Now they just seemed like silly shoes worn by a woman too vain to consider sturdier footwear. He relinquished his chokehold and shoved me toward my bedroom. “Get the door,” he said.